Carrie has problems. First, she needs to figure out what the wedding of a "mature" bride and groom should look like. Second, she’s invited Henry’s half-sister to the ceremony before learning why he’s never wanted to see the woman. Then the florists they’ve hired are shot at, their flower shop is bombed, and someone is murdered. If that weren’t enough, Carrie and Henry keep catching glimpses of a ghost dressed in a red bridal gown...an omen? 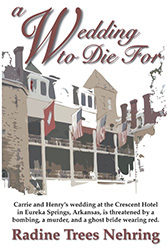 Join Carrie McCrite and Henry King as they chase a killer and try to salvage their dream wedding at the historic Crescent Hotel in Eureka Springs, Arkansas. Order an autographed copy for $16.00, postage free, from the author. The Crescent Hotel Conservatory where--after shots from the dark, a bombing, and a brutal murder--Carrie and Henry's wedding takes place. Carrie popped up in bed as if some backbone spring had snapped, jerking her to a sitting position. She shook her head, trying to dislodge the image of a bride who danced in a wedding gown that changed from ivory to the color of blood. No, no! It wasn’t real, it wasn’t, as she’d reminded herself twice before when—in her dreams—the terrible bride danced. The image disappeared, replaced by a new fright when a rattling crash came from her front hall. She’d only begun to mull that possibility when a streaking motion brought the cat out of her basket and into a flying leap aimed at Carrie’s lap. The collision shoved Carrie back against the headboard before FatCat bounced away from flailing arms and slid off the bed, pulling the white down comforter after her. Carrie turned on the bedside lamp and stared at her cat, whose face said clearly that a peril-impelled leap into forbidden territory—Carrie’s bed—should be welcomed by any human with an ounce of sense. So, FatCat hadn’t been the cause of the noise. What, then? Carrie reached out and turned the lamp off. Right now, darkness felt safer than light. 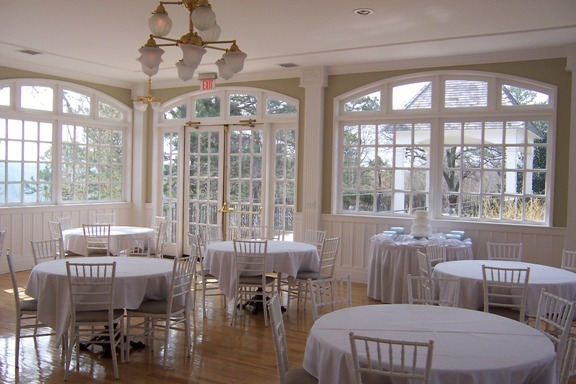 For a moment she contemplated December, when she would be a bride, and strong, fearless Henry King—former cop, her love and her new husband—would occupy this room with her. Stop it! If only was a useless supposing, and she wasn’t about to call Henry. He’d come, of course, leave his bed and come down the path in the woods to look through her house while she cowered under the covers. So! She’d take care of whatever it was by herself, just as she’d been doing here at her home in Blackberry Hollow for nearly six years. Carrie listened in the darkness. After a few minutes of monitoring, hearing nothing but her own heartbeat, she pushed the remaining covers aside and slowly, quietly, slid out of bed, dropping her feet into wooly slippers as soon as they reached the floor. She picked the comforter up and shoved it back in place, resisting the temptation to wrap its sheltering softness around her head and shoulders. Carrie shivered when she realized the comforter wrapping would make her look like a ghost...a fat Halloween ghost. She almost, almost, wished she hadn’t said no to keeping a sawed-off shotgun by her bed. Henry wasn’t keen on the idea either, though he agreed with the county sheriff that the best firearm a woman alone could have for protection would be a shotgun with its barrel sawed off 1/8" outside the legal minimum. The shotgun idea had come up when they found supplies for a meth lab hidden in the woods on the far side of Blackberry Hollow. "Very few people, high on drugs or not, will argue against a shotgun pointed in their direction," the sheriff had said. "And even if you can’t shoot well, you’ll have a hard time missing anyone who’s close enough to be inside your home when you use a shotgun. Besides, a shotgun’s usually not strong enough to blast through a wall and kill somebody in the next room." After consideration, she’d decided not having a gun would be safer for her than having one, even if it was "impossible to miss your target" with a shotgun. She couldn’t face thinking about all the things that could go wrong with any gun meant to maim or kill. She wasn’t a gun person, and she wouldn’t feel safer if she saw a gun by her bed every night. Its presence would bring only fear. The orange numbers on her clock winked from 3:59 to 4:00 a.m.
Everything was absorbed in quiet darkness except for the clock face and the soft glow of the night light in the hall. Then another crash came from outside her bedroom door. Carrie swallowed a shriek and grabbed the phone, putting her finger on the button to speed-dial Henry’s number. Henry was living in his daughter Susan’s house, just a few hundred yards away through the woods. He would come very quickly, and he would bring a gun. She stopped, her finger frozen on the button. Oh, for good garden seed! She didn’t need to call Henry. She knew what the sound was now; in fact she’d heard it several times before, but never in the dead silence of night. One of the suction cups holding her stained glass sun catchers in the hall window had come loose, that was all. Well, maybe two of them. There had been two crashes. Carrie reached for her robe, padded across the room, started down the hall. She’d check the sun catchers just to be sure. It was easy to tell. Even in the dim night-light glow, she could see that a stained glass angel was missing from its place on the square of window pane. Maybe it had fallen to the table first, teetered for a while, then dropped to the floor. Two crashes. Carrie flipped the light switch and bent to pick up the angel, sighing with relief when she saw that it hadn’t broken. Her sigh turned into a squeak of fear when she stood up and looked back at the window. The angel’s clear plastic suction cup with its hook was still stuck fast to the pane. How on earth had the angel fallen? Carrie slipped the angel’s halo back on the hook, noticing that it was very difficult to get the metal circle over the deeply curved wire. What made it bounce off that wire? Fear jerked down Carrie’s spine. To satisfy herself she needed to search the house, and do it at once. Praying Psalm 91 for protection, There shall no evil befall thee, neither shall any plague come nigh thy dwelling; and forcing boneless legs to move, to lift her feet, take steps forward, Carrie inspected every corner in her home. With shaking hands she opened all closet doors, though her breath caught in her throat each time a door latch clicked. FatCat came along, staying right at her heels. At last she shut the final door. Except for the angel, all looked normal, undisturbed. No windows were open, no exterior doors unlocked. But the angel...? What had happened to it was impossible. It had to have help, some kind of help, getting off that hook. Carrie returned to her bed but, as number after number rolled past on her clock, she didn’t sleep. Nor did she shove FatCat to the floor, even when fur tickled her cheek and the purring that sounded like a motor scooter engine rumbled on and on until dawn. The image of the bride dressed in red had been bad, but it was only a nightmare. She could wake up from nightmares. The angel was different. How did that heavy piece of stained glass get off its hook? The answer was too easy. By itself, it couldn’t have. There were things to discuss. That’s why Carrie took a peach pie out of her freezer and turned on the oven. Her friend, Eleanor Stack, said discussions with men always went better if you were feeding them. Eleanor believed food was a panacea for many things. Feminine wiles? Maybe, but one might as well use every available tool. When the oven reached 375 degrees, Carrie took the frozen pie out of its box and removed the aluminum pan, fitting the still-frozen crust into her own heat-proof glass pie plate before she stuck it in the oven. The rim of the crust with its machine-made crimps would be soft in the time it took her to pour a glass of iced tea. She bet that was something Eleanor didn’t know. As soon as the tea was ready, she opened the oven door and lifted the pie out. She used her fingers to make scalloped pinches all around the softened edge of the crust, just as she’d watched her mother do all those years ago. With the point of a knife she wrote "I Love Henry" on top, leaving the machine-stamped center hole as the "o" in Love. There. The factory-made edge crimps were gone, the pie was personalized. She approved the result and put "I Love Henry" back in the oven to bake. She’d never told Henry she made the pies she offered him, and he was probably smart enough to understand where they came from. He did say once that he thought she made better pies than Eleanor. All she’d done then was look at her plate, murmur, "Thank you," and scrape up the last bit of sugary juice from the slice of cherry pie she’d just finished eating. Come to think of it, maybe he’d said she served better pies than Eleanor. That was probably it. Serving was different from making, and Henry never lied about anything. As for Eleanor...Carrie had no idea whether her friend guessed the source of the pies she served or not. She didn’t really care, and if Henry hadn’t figured it out yet, he would soon enough. In a couple of months they’d be living together. That was the reason they had things to discuss. It was time to talk about their wedding. Though Henry asked her to marry him three weeks ago at the Elderhostel in Hot Springs, and she’d said yes, they hadn’t made any real plans yet. She knew what she wanted, she just didn’t have a clue to what he had in mind. It was time to find out. Three hours later Henry had come, they’d talked—more or less—and he’d left for Roger and Shirley Booth’s dairy farm in the valley. He and Roger got together every month to work on the agenda for the next Rural Water Board meeting, and today Shirley had invited Henry to have supper with them after the planning session. She’d included Carrie too, but Carrie declined. She needed time to make wedding plans and figured, after talking things over with Henry, she could settle down and get started. Ha! Henry had no plans. He promised to think more about it, had a piece of pie, kissed her, and left for the Booths’. The one thing she did find out was a huge surprise. Henry had a half-sister. She’d asked him, very cautiously, about inviting relatives to the wedding. He never talked about his parents or family—indeed, seemed to avoid the topic. But now that she was going to be his wife, Carrie thought it was time to know more. At first he’d insisted that his daughter Susan was his only living relative. He had no aunts or uncles, no cousins, nieces or nephews. Then, finally, he admitted there was a much younger half-sister, saying it so reluctantly that Carrie was bewildered. What’s more, he added that he had never seen this sister and had no idea where she was. After a conversational dragging session—Carrie asking question after question while Henry answered in monosyllables—she’d learned that Henry’s dad left his mother for a much younger wife, Elizabeth MacDonald, when Henry was already a married adult. The father’s second marriage produced one child, a daughter named Catherine MacDonald King. Henry "supposed" that had been around thirty years ago, which meant his half-sister and his daughter Susan were nearly the same age. He insisted he knew nothing at all about this young woman, the product of a marriage that had split his family. But, Carrie thought, how could he possibly resent Catherine now? He obviously knew nothing about her, and the poor girl didn’t choose her parents or the facts surrounding her birth. Carrie wondered whether the half-sister could be anything like Henry. She pictured Henry’s black hair, brown eyes, and square jaw on a woman. Well...maybe not quite that. But with both of his parents dead, it was now high time the two siblings met. She was going to do her best to find Catherine. Finding her could be a wonderful wedding present to herself as well as Henry. She would give them both a sister. As soon as Henry left she sat down at her computer, logged onto the Internet, and began a search for Catherine. Order an autographed copy, postage free, from the author.